ISTANBUL (Oct. 24) — Day three began with great vigor and ambition as Serkan took us to the Topkapi Palace. However, the lines were a little too long so we revised our plan and ended up going to the Istanbul Archeological Museums, which turned out to be a fortunate turn of events. The museum houses incredible pieces of ancient history that can only be seen at this museum — including a piece of one of the Seven Wonders of the World. How many of you can say you have had a picture taken with a Wonder of the World? One of us (again, we do not name names) let our geek flag fly with pride as we relished the antiquity that surrounded us. But, in this person’s defense, how could she not? After brushing up on our ancient history, we decided to treat ourselves to the oldest candy store in Istanbul. I suppose Serkan felt that we had behaved ourselves well enough at the museum and so deserved a little something special! We enjoyed chocolate covered grapes, almonds, and pistachios as well as almond ezme (Turkish almond paste candy). Running on a good sugar rush, we immersed ourselves in the wonderful smells and colors of the spice market. A true gourmet’s delight, the spice market is full of mouth watering scents and flavors, all ready for inclusion in a delicious dish just waiting to be prepared. Saffron, Ottoman Salad spice, vegetable spice (great for soups), cinnamon, star of anise, peppers, and curries, just to name a few, are readily available for purchase. Just next to the spice market is a Turkish Coffee shop favored by the locals and described as top quality. And this time, we really mean “Turkish” Coffee! We made sure that we did not leave empty-handed and bought plenty of spices (they are vacuum sealed so can be brought on the plane) and coffee to bring back home. 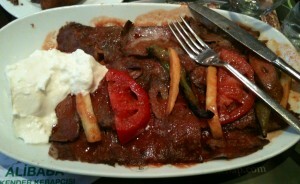 Alexander kebabs — beef kebabs with potato, tomato, bites of pita bread, bell pepper, and yogurt. Delicious. When lunch time came around, we went to a kebab restaurant – after all – how could we come to Turkey without trying a kebab? For starters, we ate içli kofte (minced meat wrapped in bulgar), çig (meat cooked by spices wrapped with lettuce with a few drops of lemon added), and puf pita bread (which is very light and airy). After these lovely appetizers, we had Alexander kebabs (beef kebabs with potato, tomato, bites of pita bread, bell pepper, and yogurt that will make you rethink the real definition of yogurt … yes it really was that good and fresh). The meat was tender and full of flavor, and we already told you how we really feel about the yogurt. Alexander kebab, just one of a number of kebab options, is a traditional dish of Bursa where silk farms are prevalent. Even though it is customary for kebab restaurants to offer teas and coffee for free (even if listed on the menu), we had to decline and dash off to the next phase of our tour extravaganza. We darted to the Bosphorus, where we took a boat cruise, which is a great way to see the coast line of the city along the Bosphorus Straight. The cruise was made all the better by Serkan’s knowledgeable insight into the city’s history and architecture. After perfecting our sea legs, we returned to land and finally went to see the Topkapi Palace, and this time – SUCCESS!” The lines were gone. The palace has incredible and ornately decorated rooms that were once inhabited by the Ottoman Empire’s Sultan and family and was the base of government for political, ceremonial, and educational affairs. The elaborate tiles, costumes, and jewels exemplify the lavishness once associated with the Ottoman Empire. To wind down the evening, Mustafa took use to an excellent restaurant that offers great atmosphere and cuisine. We sat around the table on pillows and savored sarma (couscous stuffed grape leaves with yogurt and tomato sauce) and two varieties of gösleme (pita pancake which we watched being made at the front of the restaurant – one version was stuffed with spinach and feta and the second with potato); and that was just the beginning. For our main course, we had chicken shish (chicken cooked on a skewer with hot pepper, tomato, and potato) served with rice and a small salad. To avoid dry mouth, we drank a very refreshing lemonade with mint, which was a little less “pucker” than what we had the day before. Our dessert consisted of three types of baklava (one with pistachio and two versions with walnut) and rice pudding, all of which can be summed up with a simple YUM! Alongside our desserts, we enjoyed apple tea and tarcan tea. Mustafa is a friend of the restaurant owner, so we were treated with extra special care. With full and happy bellies, we returned to our hotel to rest up and prepare for our venture to Ephesus! It is 6 am as I am reading your blogs from the past 3 days. Although my only thoughts at this hour consist of finding a decent cup of coffee, now my mouth is salvating and I can’t wait to be a part of the inaugral tour to share the same sights, tastes & smells. I greatly look forward to reading your additional posts on this adventure. Happy travels!